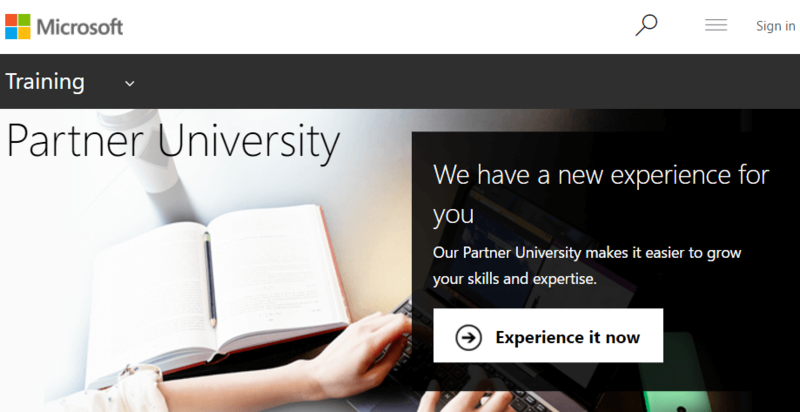 Have you heard of Microsoft’s Partner University? It’s a new section on the Microsoft Partner Network (MPN) website dedicated to Microsoft training and targeted at Partner employees. The purpose of the Partner University is to make it easier for consultants who work with Microsoft technologies to find the training resources they need. The page gathers links to the main sources of official Microsoft training material. This way, you can find in one place all the relevant information for your products of expertise. The Partner University also allows you to find pre-set learning paths or create learning plans for yourself and your team. To get started with it, it’s this way. Note that you will need to have an active MPN account in order to log in to the Partner University and get the best out of this resource. The Partner University Programs and training page gathers the main Microsoft training resources, we strongly recommend keeping it bookmarked! An update of the Partner University learning path section is planned for mid-June. It will allow you to search for specific courses based on role and product, and will include a gallery of the newest courses. Details about the update are available here. If you’re interested in free online Microsoft training resources, this page will tell you how independent consultants can get access to specialised Microsoft training material.